itracks is a world-leading provider of online qualitative research tools. Researchers, agencies, and other organizations utilize itracks’ unique tools for full service research in marketing and branding. With more than 500 market research clients and nearly 2.5 million people available to provide answers, it is clear why itracks would be ranked amongst the Top 10 most innovative research companies in the world. Before development of the itracks Mobile BBFG (Bulletin Board Focus Group) app, I had never heard of itracks (I should mention that others in CollegeMobile had). I heard we were developing a research mobile app, but I really had no idea that it would be all that innovative – until I heard the concept. It’s very rare that you can earn rewards like cash and gift cards for using a service, and even less so for using a mobile app – but with itracks Mobile, you do. This is how the itracks service works: People sign up for itracks panels as well as other partner panels, these people are selected for studies, they respond to specific questions and tasks, are rewarded points, and then redeem these points for rewards. The purpose of the itracks Mobile app is to enhance the itracks BBFG service by allowing iPhone, iPad, and Android users to post videos and provide qualitative feedback on brands, products, and more. Users can also comment on others’ videos and feedback. These mobile app features encourage innovative and interactive focus groups that can gather qualitative data directly from the location of their experience. Because of this unique research mobility, participants can submit responses at the lake, on the bus, at a vacation destination, the list goes on. Obviously, offline usability is very important for an app like itracks Mobile, considering the app may be used in locations similar to what I had just mentioned. Offline usability is something that organizations should always consider when their app might be used away from a data/Wi-Fi connection. 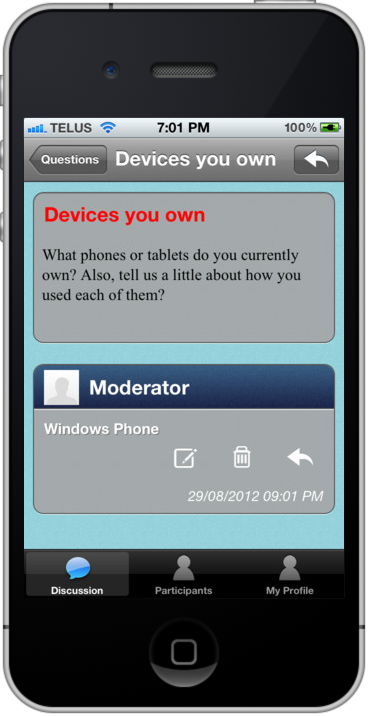 The itracks Mobile app can be used without a data connection, and then responses are submitted when the user reconnects to a network. We are proud to present the itracks Mobile BBFG app! To learn more about itracks Mobile, check out the itracks Mobile portfolio page.